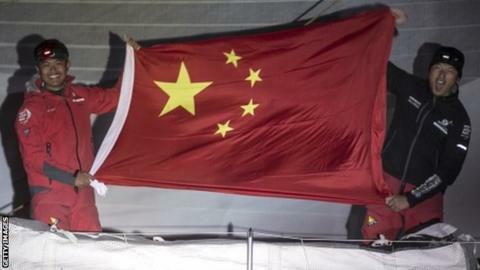 Chinese challengers Dongfeng Race Team won a closely-contested sixth leg of the Volvo Ocean Race. They beat overall race leaders Abu Dhabi Ocean Racing into Newport, Rhode Island, by just three minutes and 25 seconds after 17 days of racing. Wednesday's victory in the 5,010-nautical mile stage cut the deficit to the Emirati boat to six points. It leaves Dongfeng with a chance of overall victory with three stages remaining. The Chinese boat had missed leg five with a fractured mast. Abu Dhabi came close to overturning Dongfeng's lead 30nm from the finish. British skipper Ian Walker said: "We were literally three or four boat lengths from getting over them, but they held on." Teams now have 10 days in dock in Newport for maintenance before returning to the offshore action with the trans-Atlantic leg to Lisbon, Portugal. The Volvo Ocean Race started in the Spanish city of Alicante in October, with teams visiting 11 ports in 11 countries across nine legs. The race finishes in Gothenburg, Sweden, in June.